It’s hard to crave salad when it’s so chilly outside. Much easier to crave a big bowl of mac and cheese or mashed potatoes, approved but those will do nothing for a New Year’s Resolution. We got a new grill for our balcony for Christmas and have been grilling everything we can think of since then. Last night, audiologist we grilled our salad. 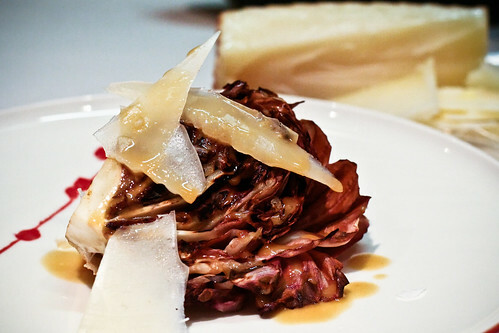 Since radicchio is slightly bitter, we topped it with nutty Manchego cheese, sweet pear slices and a honey and Dijon vinaigrette. (Photographed without the pears – oops!) The result was a warm and comforting salad that’s right at home next to skirt steak and grilled whole wheat bread. This is the perfect time of year to experiment with warm salads, even if you don’t have a grill. Use your oven’s broiler, grill pan or large saute pan. However you do it, you definitely should. Whisk the dressing ingredients together until well-combined. Set aside. Heat a grill or grill pan to medium-high. While it’s heating, brush the radicchio pieces with olive oil on all sides. Place the radicchio on the grill for about 4 minutes on each side, or until it wilts and starts to brown. Remove to a plate, place Manchego and pear slices on top and drizzle with dressing. Yum! Agreed that it’s hard to eat cold things in winter, but this salad looks craveable. I agree with Maggie — highly craveable! Fantastic!! I have made a grilled romaine salad and loved the char flavor. Great flavor combo here.